Lapworth D J, Carter R C, Pedley S and MacDonald A M. 2015. 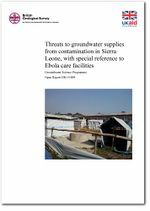 Threats to groundwater supplies from contamination in Sierra Leone, with special reference to Ebola care facilities. British Geological Survey Internal Report, OR/15/009. This page was last modified on 27 November 2015, at 09:39.